Kajaani Process Measurement's Sheet Brake Detector is chosen by CANFOR, Prince George, BC after extensive testing of other manufacture's similar equipment. A second WebEye was recently ordered to be also installed in this very demanding application in the dryer hood. The WebEye is unaffected by direct or reflected visible or infrared light, static electricity, steam, extreme temperatures, dirt or vibration. WebEye reliably detects sheet breaks 100% of the time. Utilizing state-of-the-art fiber optic technology, WebEye eliminates many of the problems that affect other detectors, such as disturbances from the operating environment. Saves thousands of dollars by preventing machine damage. Continuous monitoring of the web with infrared light. Detectors can be used to indicate whether the web is running in the right direction. No false break signals. Unaffected by direct or reflected visible or infrared light, static electricity, steam, extreme temperatures, dirt or vibration. Self-cleaning, using a continuous flow of air through the pipe enclosure to keep positive pressure around the sensor. Minimal installation space required. 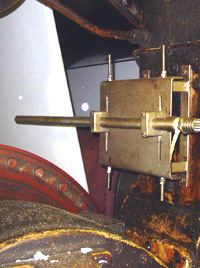 The unit may be installed between cylinders, above felts and rolls and in press gaps. The sensor may be located 4-12 inches from the web. The elimination of false alarms or missed breaks, as well as a reduction in required maintenance. Immediate response to a web break is due to the 4 kHz IR light frequency.